Do you need help with your Moultonborough home? At Rowell’s, we aim to offer you the very best when it comes to working on your electrical systems, your plumbing, or your HVAC systems. In fact, we are always happy to help you out. There’s not a job that is too big and complex or too small and simple for us to tackle and overcome for you. Call us today and feel free to ask us any questions you might have. We are always happy to help you out. Many people in Moultonborough call us about cleaning out their drains or getting their sewers cleared of debris or tree roots. We are always happy to help. In fact, our plumbers are all experts on these very things, so we would love to come out and get everything flowing for you once again. When it comes to drain cleaning in Moultonborough, it can be as simple as running a plumbing snake down through your pipes, or as complex as clearing out your sewer drain. The only way to know for sure is to have your plumber take a look. However, it can be helpful to look at which drains are clogged and where they are in relation to one another. If you only have one drain clogged, it’s more likely that the problem is local. Even if you can’t figure out how to solve it yourself, it’s likely that the clog is in one of the pipes that only affects that drain. If, on the other hand, you have several drains clogged, it’s more likely that the clog resides deeper in your system. If all of the clogs are in one bathroom, the clog may be in one of the drain pipes that lead away from that area. If you have clogs all over your house, that’s when we’ll want to take a look at your sewer. Many people in the Moultonborough area are on septic tanks rather than sewer systems, and we can help you deal with those, too. As you know if you live on one, septic tanks come with their own needs and problems. We know them inside and out, so we can always help you determine what has gone wrong and what will help repair the problem. Septic tanks need to be pumped out every once in a while, either because they fill up or because they have another problem that pumping can help. Give us a call if you think it’s time for your septic tank pumping and we’ll get to you as soon as we can. Our septic tank experts will get on the job and get your tank pumped out quickly and efficiently, so you don’t have to worry about your system anymore. Maybe the problem with your Moultonborough home isn’t with the plumbing but with the HVAC system instead. Winter is definitely coming, so it’s time to give us a call when you notice any problems. We can help you repair your furnace in Moultonborough or help you choose a new one that will work for you this year and for many years in the future. We’ll always send someone out to you fast since we know that going without your HVAC system is uncomfortable and can even be dangerous in extreme temperatures. We’ll assess the problem, then notify you as to what needs to be done to repair it. If you have any options, we’ll let you know. 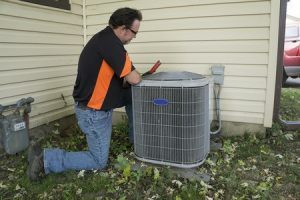 We’ll even let you know if replacing your unit will be less expensive than repairing it. This happens, sometimes, and we never want to charge you more than you have to pay. We’ll give you realistic estimates for both repair and replacement, then let you choose which one you want to do. Either way, we’ll get the job done fast and just the way you need it to be done. Whenever you need help with your plumbing, heating, air conditioning, or electricity, call us at Rowell’s Services. Our certified technicians will set things to rights fast, so you don’t have to stress about your house.